The new crab cakes feature snow crab seasoned with butter, onions, garlic, and peppers. They're available in a combo meal for $4.99 or as an appetizer of two crab cakes for $3.49. The $4.99 Grilled Crab Cakes Meal includes two crab cakes on a bed of rice with two sides of your choice and a breadstick. The chain is also offering the $4.99 Crab Lovers meal. 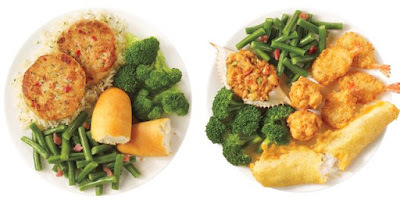 It includes Seafood Stuffed Crab Shells, Batter Dipped Fish, crispy-fried Butterfly Shrimp, two sides, and hush puppies. In other parts of the menu, Fried Green Tomatoes are back and new Key Lime Pie is available for dessert.